The Side Table is designed to be used alongside other items from the Spa Surround Furniture collection to create the ultimate outdoor oasis that perfectly surrounds your 72 in to 84 in diameter circular spa. It features an attractive wicker finish, constructed of a durable, weather resistant, synthetic rattan. Its hollow side allows space for you to conveniently store your towels and other items. This table also doubles as a bar stool that will fit perfectly under your Spa Surround Furniture Bar Table. Care Instructions: Your outdoor furniture can quickly and easily be cleaned by spraying it down with a hose. When you want a more thorough clean, wipe frames with mild detergent in lukewarm water. Rinse with clean water and let dry thoroughly. Avoid strong detergents and abrasive cleaners. Recommended: Although resin wicker is incredibly durable, we recommend that you use a protective cover when your furniture is not in use to help keep it looking new. 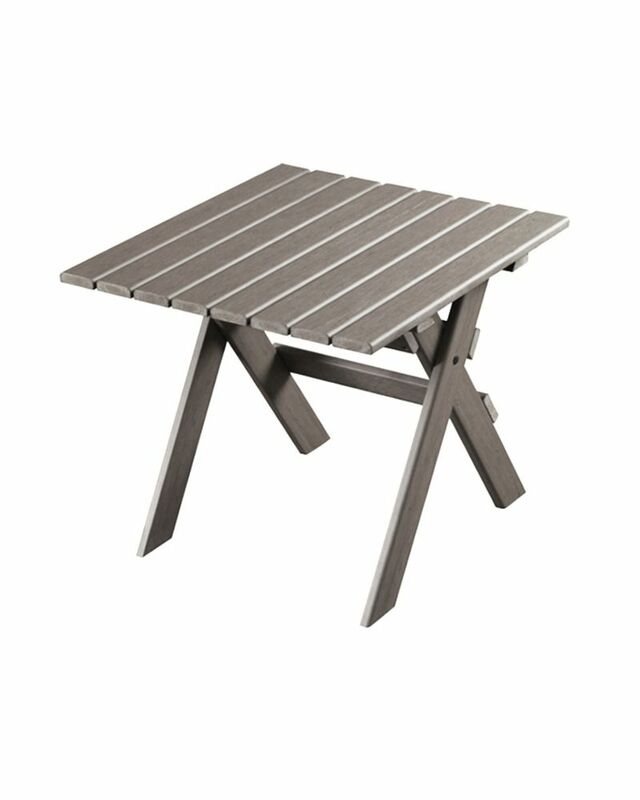 Muskoka Patio Side Table in Grey The Eon Adirondack Collection truly delivers lasting natural beauty. Crafted from an innovative all-season resin that boasts incredible fading and weathering performance, Eon's premium products maintain their beautiful, natural wood-like appearance over their very long lives. Eon technology eliminates the frustrations associated with sanding, staining and painting. Eon is one of the finest alternatives to wood available on the market today. This beautiful Adirondack collection is comfortable and durable and designed for easy assembly. To further compliment these beautiful Adirondack chairs, Eon also offers a matching side table and ottoman. Available in 3 amazing finishes: Cedar, Grey and White.